Happy Canada Day! To my American friends, Happy Independence Day! Tonight I am going to sit on the roof of my house with Andrew and watch fireworks explode in the sky. This may sound like a romantic evening, but more likely I will be trying to see the fireworks through a pile of hair and drool. Our dog Audrey, who is not by any means a lap dog, but will be convinced she is when the fireworks terrify her into a shaking, shedding, lap sitting, drooling, mess of a dog. You may feel sorry for her, but this same thing happens when I set the clock on the stove or paint my nails. You could say she is a bit of a wimp. On the other hand, I am a big wimp when it is this hot! I mean it is so hot and humid in Toronto right now, and with an air conditioning free house, I am feeling it. So what to make for dinner when it is so stinking hot? 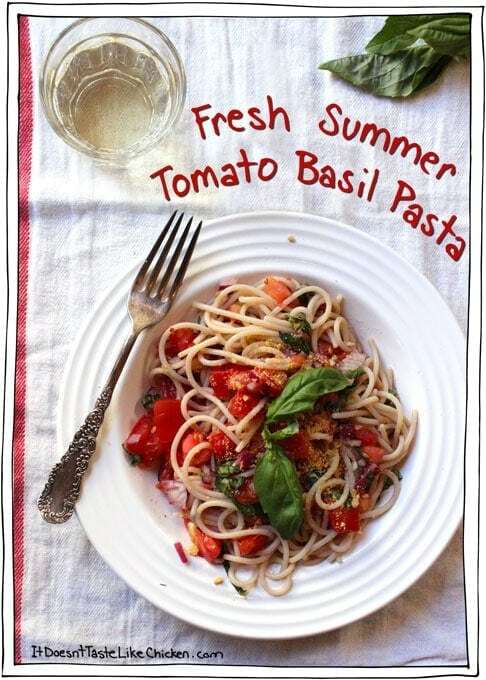 Something fresh, light, and summery, such as Fresh Summer Tomato Basil Pasta. Yeah, you could have seen that coming! It really is an all time fav. This pasta takes only 15 minutes to whip up, and only one pot on the stove (no oven heating up your house). Summer tomatoes, is there anything more scrumptious. I don’t even bother buying tomatoes in the winter as they are usually hard, flavourless and grainy. 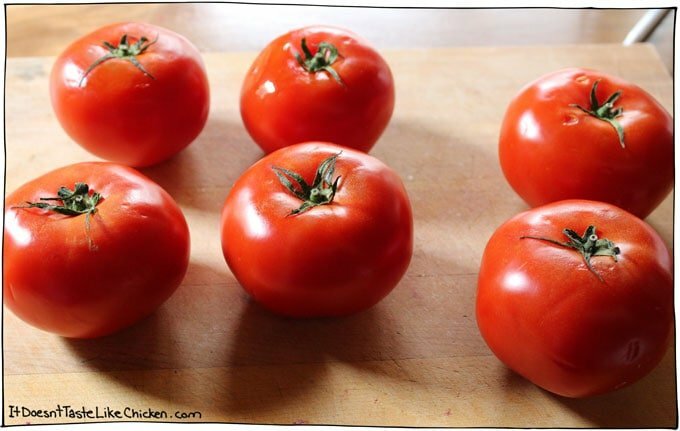 But in the summer, local tomatoes are full of rich tomato-y goodness, so I wanted to feature them today in this dish for the 1/100/100 Challenge. 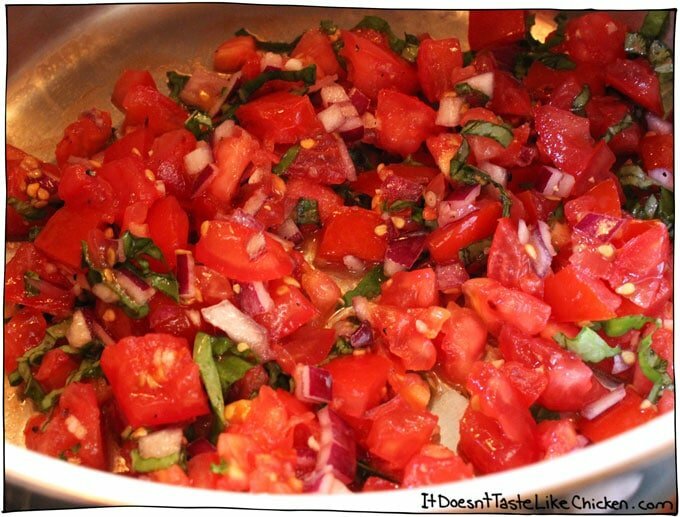 I toss them with a bit of fresh basil, raw garlic, some sweet red onions, and a little spice, if you like. Toss these fresh raw ingredients with the hot pasta and the aromas and flavours release making a pretty damn scrumptious dish. Beautiful tomatoes. Just sitting there being all devourable. Start by boiling a big pot of water, and cook your pasta according to the directions on the package. 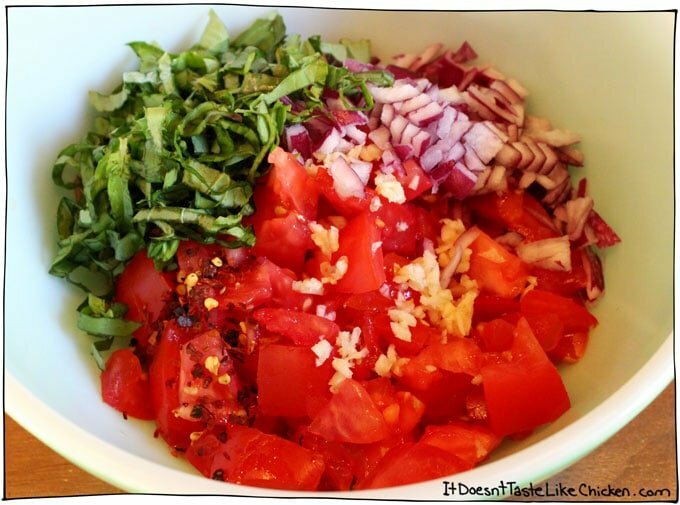 In the meantime, chop the tomatoes, onion, garlic, and basil and put in a bowl. Add the chili flakes if using, and the salt. Give it a toss and let it hang out. When your pasta is done, drain and set aside. Now dump your tomato mixture in the hot pan, give a stir, and then add the pasta back in the pan with the tomatoes, and toss to combine. Serve right away with a sprinkle of parmegan. 353 Days, 97 Recipes to go! Yummy. Made it tonight for dinner and my 3 year old niece loved it too. 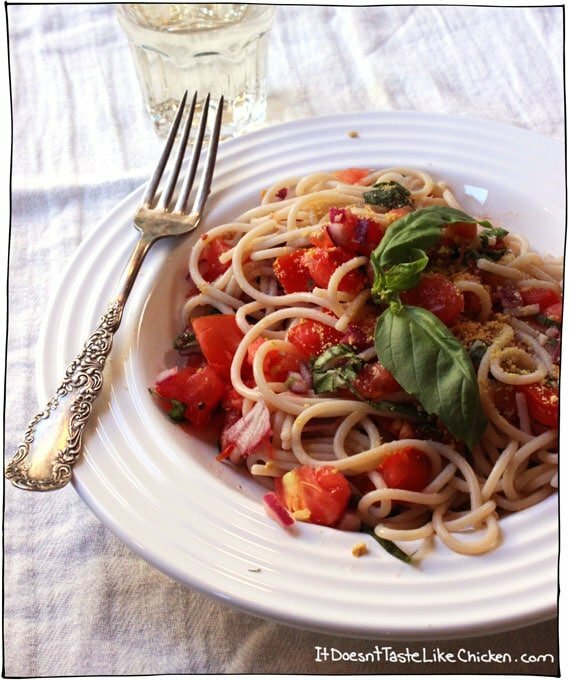 I love this kind of simple pasta sauce… no fuss, just pure flavour and goodness. Made this last night, whipped up in about 10 minutes and just so fresh tasting. Would be even better during tomato season! Thanks for the inspiration, Sam. Oh yes, this is my favourite when tomatoes are in season!! So glad you enjoyed it. Thanks! I’m making this tonight! How much basil? The recipe is silent on the amount. Oh my! Silly me. You’re right Linda, I forgot to write that down! I have the recipe written by hand in my kitchen and when I make it back there today, I will update this post. In the meantime if you are planning on making this soon, it’s about half a bunch of basil. Thanks for pointing that out! I am trying to stave my oil addiction and I can’t believe there isn’t any oil in this recipe – not even a splash – I have GOT to try! All my favorite flavors! Oh, thank you! I will make both of these as Caesar salad and mac-n-cheese are both favorites. If I cut out the oil do you think maybe I could lose at least one pound??? Ha ha. Being vegan isn’t really about weight for me but I do hope my cholesterol goes down – ultimately I am so much happier for the cows pigs and chickens! I love the name of your blog by the way – it is so clever and I’m thankful it doesn’t taste like chicken! I bet you will indeed loose a pound if you cut out oil. Did you know that when you eat 100 calories of fat (1 Tablespoon of oil), it only takes 3 calories to turn it into body fat. Meaning 97 calories of fat go straight to your hips!! If you haven’t yet read it, I highly recommend the book Eat to Live by Dr. Joel Fuhrman. He talks about ultimate health, and weight loss. I just finished it and it is my new favourite. I feel like I understand everything about how our bodies react to food now! 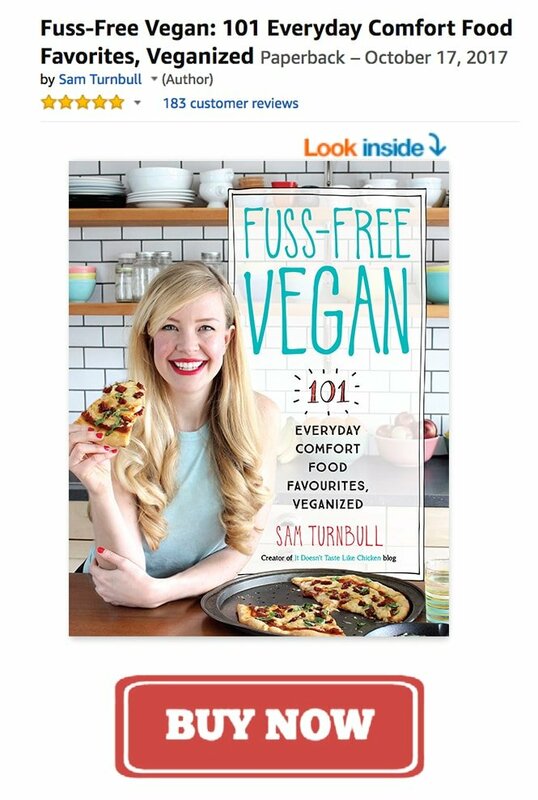 Hope you enjoy the recipes, let me know how they turn out for you!